Some of you local people probably already know this, but a lot of newcomers may not. 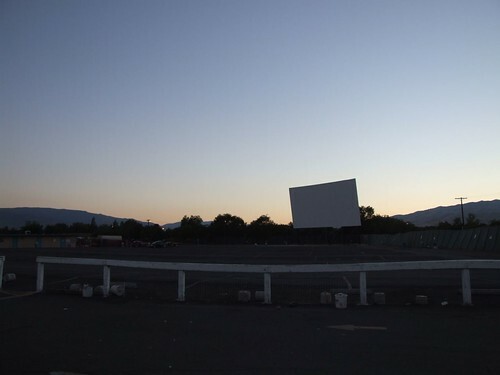 There is still one drive-in movie theater left in Northern Nevada, the El Rancho in Sparks. One of only about 400 such theaters left nationwide (and only two in Nevada, the other being in Vegas) the El Rancho has been the subject of several Reno Gazette-Journal articles over the years (like here, here and here). Built in 1951, it hasn’t changed much since that time. The projection equipment was replaced in the 1960s(!) and the speakers on poles were done away with in favor of FM transmitters. But the experience of crowding together in your car and feeling the cool night air as you watch a movie hasn’t changed at all. On Tuesday this week went took a trip up to Reno to see a movie. We know from experience that Sam has problems sitting patiently through a two-hour movie, so going to a regular theater was out. 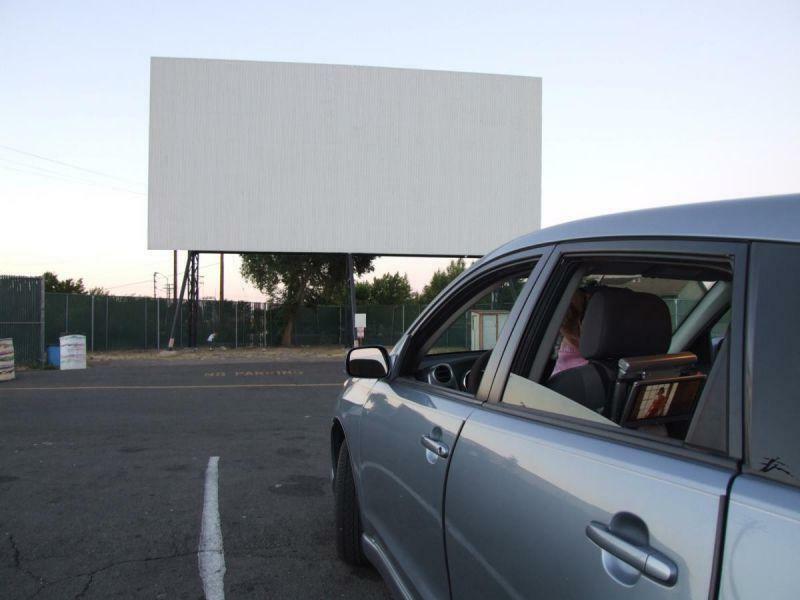 But here at the drive-in, he’d have the whole car and all his toys to play with if he got bored. It was the perfect set up. And at only $4 per adult, it turned out to be about half the price of heading to one of the Century theaters downtown or at the mall. And we were able to buy our candy at Wal*Mart, which saved us even more. The theater grounds themselves are old, and they look like it. A low little snack bar and the A-frame projection booth are kind of huddled together in the center, and they both look like they’ve been forgotten for decades. Cracked pavement, ratty fences, and multi-color trash barrels everywhere just add to the effect, and the whole thing adds up to make you think that you’re just lucky they’re even keeping the theater open. They’re certainly not putting any money into improving it, but at least it’s not decaying like most abandoned drive-ins. 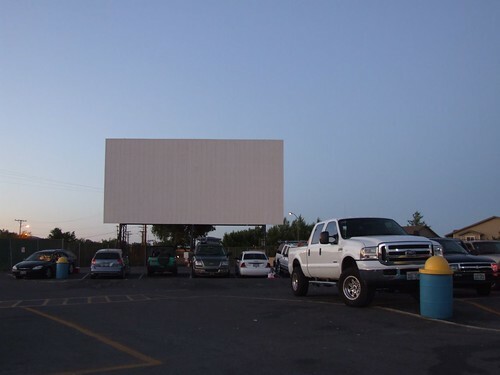 The screens are clean and in good shape, and once it gets dark really all you care about is the picture up there anyway. All together it was a fun night, although by the time the second feature started it was almost midnight. With Sam half asleep on the dashboard and an hour’s drive home in front of us, we decided to bail instead of sticking around. On our way out we passed by the old-style marquee, with the crooked plastic letters spelling out the names of the four features, and we wondered how much longer this drive-in would be around. Century Theaters, who owns it, has said they have no plans to close it as long as it stays profitable and the land value doesn’t skyrocket. Given it’s location, in a run-down part of Sparks, boxed in by mobile homes and adjoining a neighborhood park, I don’t think it’s in danger of that happening. And as long as they keep running it with a bare minimum of staffing and maintenance, I can see it being profitable for years to come. So I don’t think the El Rancho will be going anywhere soon, and it should keep throwing movies onto those corrugated screen for a long time. 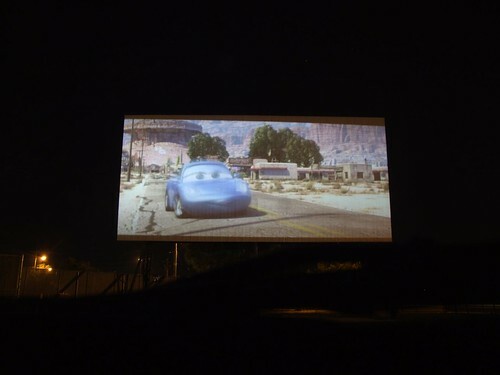 I’ve put up more pictures from the drive-in here.